These illustrated, interactive flashcards are fully-referenced to signpost further reading. They can be viewed on your PC, Mac, iPad or iPhone making them an extremely handy reference resource for both opportunistic study and day-to-day access. 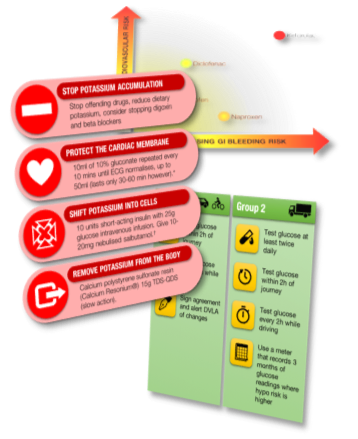 Carry your digital deck with you as a pocket reference, giving effortless access to at-a-glance summaries of clinical guidelines, evidence or legal aspects relevant to your role. ‘Learning Quizzes’ help you remember the dry rote-learning topics such as DVLA guidance or controlled drug schedules. AND a free mock paper! 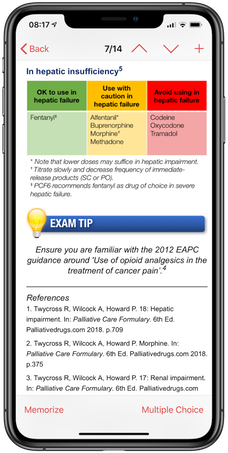 This flashcard deck also includes a full 100-question, 3-hour mock exam paper mapped to the latest RCP blueprint for a realistic, never-before-seen test of your knowledge. You’ll need the Flashcard Hero™ app from Kitestack software to view these flashcards (sold separately for around £3.99, but included in our starting price of £31.49 above). It’s available on the App Store for iOS (iPhone and iPad) and Mac, as well as in the Microsoft Store. It’s not yet available for Android. See below for detailed options. Flashcard Hero™, by Rico Gunderman, is a brilliant piece of software that displays our flashcards, giving you the tools you need to revise effectively. Using Flashcard Hero you can enter ‘memorize mode’ which lets you cover/uncover your flashcards, mark how confident you are at recalling them and focus on your weak points. ‘Multiple choice mode’ gives you the chance to test your knowledge on one of our learning quizzes or sit a full mock paper (complete with answer explanations). 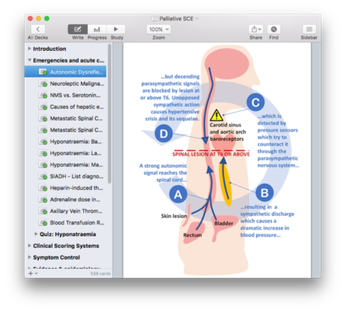 Or you can simply search and browse your flashcards for a quick refresh of clinical knowledge. Flashcard Hero™’s unparalleled portability and interactivity makes learning your SCE Flashcards active, effective and enjoyable. We recommend you download and install Flashcard Hero™ first on whichever device(s) you plan to use the SCE Flashcards on. Then pay once for the flashcards and take them with you, on all your devices, wherever you go! 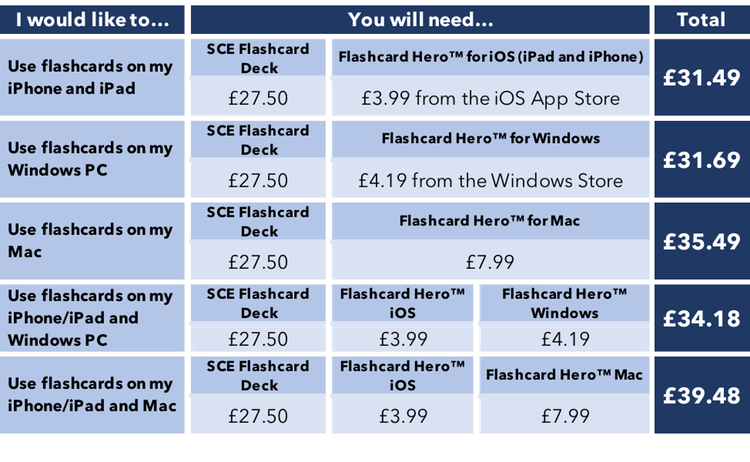 Once Flashcard Hero™ is installed, you’re all set to purchase your deck of SCE Flashcards. For further explanation of pricing, see section below. *Price excludes Flashcard Hero™ app. Clicking the button will redirect you to PayPal for secure payment. Pay by debit, credit or PayPal. You do not need a PayPal account already. Delivery is via email address specified during payment, usually within 48 hours. Please ensure your mailbox can accommodate total attachments of around 15MB. Once ordered, flashcards will be delivered to the email address specified on your payment. Please allow 24-48 hours for delivery after payment is made.